How To Use Coconut Flour is #10 in my monthly blog post series on gluten free flour. You can see the full list of posts at the bottom of this page. The idea is to learn to use the flours you like, to make foods you enjoy. As you notice what kind of recipes you like to make in your own kitchen you can focus on them and improve your results. This series of blog posts started when I wanted to create a resource for my subscribers, a downloadable chart with tips for using different flours. When I began to write this series I never thought beyond six different flours but as I learned and shared I was inspired to keep going. 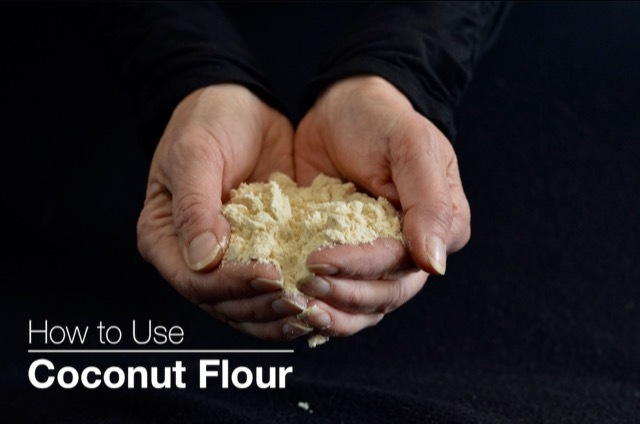 Everyone has different preferences and dietary needs so despite the cons I had heard about coconut flour I set out to learn about its’ benefits. Coconut flour is difficult to work with. Both gluten free and non-gluten free bakers will tell you this right up front. So do we really need coconut flour? The answer is of course not, but I encourage you to have a look at the health benefits to see if it might fit into your diet somewhere. And if not that’s fine too. I bought coconut flour when I had no idea what gluten free flours I wanted to use. It kept showing up in recipes I looked at, I started to see coconut products everywhere and finally I thought I should buy some. However, after using it in a few forgettable recipes my coconut flour got left at the back of the cupboard (in that bucket of forgotten flours). I read about the challenges of working with it so wasn’t inspired to keep trying. Now, after writing nine posts in this series I took another look at coconut flour. To be honest I will probably not do a lot of baking with coconut flour. I’m not personally trying to eat more baking (because when I bake it, I eat it). My goal is to help you find your go-to recipes for everyday life and to increase your confidence to try new recipes. There are health benefits to using coconut. This is not my area of expertise but I know many people with celiac disease and gluten related disorders work with dieticians and specialists to improve their gut health. It takes effort but when I talk to people who have succeeded I can hear it in their voices that it was worth the effort. After all, we are what we eat. The most obvious benefit is the high fibre content, celiacs are always looking for more fibre. It has more than double that of many other flours with 10 grams of fibre per ¼ cup of coconut flour. Using a few tablespoons in some of your regular recipes is an easy way to try it out. If this topic interests you Gretchen at All the Love, Without the Wheat created this helpful chart. It compares carbs, fibre and protein in several gluten free flours. Absorbs lots of liquid in baking so does not substitute well in recipes that were not written for coconut flour. Should be stored in an air tight container as it tends to absorb moisture. Ideally stored in the fridge or freezer. Expensive compared to other gluten free flours but Shirley over at Gluten Free Easily reminded me that cost is relative. She keeps her coconut flour in the freezer and when a recipe calls for it she has it on hand. Does not behave like a typical flour and presents unique challenges in baking – so just be up for the challenge and you’ll learn something. On Amazon both Anthony’s and Terrasoul advertise their coconut flour as gluten free. I’m just experimenting with coconut flour. During the process of writing this series I have become more adventurous. I am trying all kinds of flours, two to four tablespoons at a time, in many of my tried and true recipes. You might want to try this approach with any neglected flour in the back of your cupboard. My basic Banana Muffin recipe is my go-to for experimenting. I swapped 2 Tbsp of flour for coconut flour and the recipe worked as usual. I was surprised that I could recognize the faint coconut taste. If you are a fan of coconut add ¼ cup grated coconut to this recipe and call them Banana Coconut Muffins. If you are inspired to bake with coconut flour there are bloggers out there who have loads of experience incorporating it into their diets. For best results they generally recommend trying recipes that were created for the unique properties of coconut flour. This is the tenth in a series of blog posts on gluten free flours. My intention is to provide a basic overview of several gluten free flours for the everyday home cook, both new and experienced. Let me know in the comments below if you have a specific problem with your baking or a tip you’d like to share.